Mustard Me Yellow: Banana Nutella Ice Cream. This ice cream is a healthy alternative to regular ice cream, and it tastes amazing too! Here's how you make it: (this is just a guideline of what to do since this recipe isn't very specific). In a blender or food processor combine one frozen banana, several spoonfuls of nutella (more is better I'd say! ), one teaspoon of cocoa powder, and a few splashes of milk. Blend all of the ingredients together until smooth. I wanted it to be more ice cream-like and less milkshake-like, so I put it in the freezer for a while to harden up. 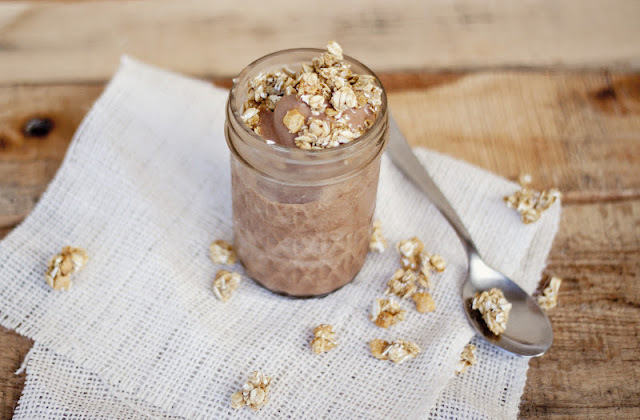 You can top it with granola, some sliced bananas, cocoa dust, more nutella, or anything you want!